Brunone (Ludvig Lindström, left) and Pietro (Markus Pettersson, right) reveal Enrico’s (Kinga Dobay) true identity. Photo: Markus Gårder. The Vadstena Academy’s mission is to provide training to promising young opera singers (and indeed musicians and backstage staff), setting them the task of performing in works not part of the usual repertoire. This summer they perform a gem found gathering dust in the Royal Library in Copenhagen: Donizetti’s first performed opera. Enrico di Borgogna premiered in Venice in 1818, but this is its first production since then. The young Donizetti’s music is noticeably influenced by Rossini (especially in the dramatic and effective overture) but this is nevertheless a remarkably mature work from the then-20-year-old composer. The music is dramatic and emotionally expressive, but never gets bogged down in excessively long arias (though Donizetti includes plenty of demanding technical challenges for the singers). The plot revolves around love and power. Before the start, King Alberto of Burgundy is murdered by his jealous younger brother but the king’s baby son Enrico is saved by Pietro, a knight, who flees with him to a remote corner of the countryside and disguises himself as a hermit. Enrico grows up protected from his usurping uncle but believes himself to be Pietro’s son. He falls in love with Elisa, daughter of the local duke who packs her off to court where she catches the eye of Guido, the usurper’s son who has just succeeded to the throne. During the course of the opera Enrico discovers his true identity, joins Pietro and a group of conspirators who aim to restore Enrico to his rightful throne and (eventually) saves his love from being married against her will to Guido. Pietro (Markus Pettersson) opened the opera with an expressively sung lament over his dead wife, in a powerful heroic tenor voice with an exciting Italianate ring. He was also very effective in ensemble scenes such as the meeting of the conspirators at the beginning of Act 2 where he proclaims the return of their rightful king. Pietro’s good friend Brunone (Ludvig Lindström) had a fine, rich baritone voice and a commanding stage presence. He is both an important member of Guido’s government and the leader of the conspiracy to overthrow him. Enrico is a dramatic mezzo-soprano role mainly in the mid-to-lower register but requiring a good top register for the technical flourishes in the arias. Kinga Dobay was an excellent choice for the part. Her vibrato was just right, enough to add emotion but never obscuring the text or the music. Her rich lower register is beautifully employed in her first aria as Enrico longs for Elisa, but she is also very effective in the more dramatic scenes such as her meeting with Elisa in Act 2. Enrico, Pietro and Brunone were all superb in the trio ending the first part of act one, where Enrico is told of his true identity and the group set off to Arles to overthrow Guido. None of them know, however, that Guido (Thomas Volle) is in love with Elisa and intends to marry her. Guido comes across visually as a bit of a cartoon villain (greasy hair plastered over his forehead, an all-black wardrobe) and Mr Volle is certainly not afraid of being the bad guy. But his Guido is well-characterised and is given a bit more depth through his expressive tenor; while he rides roughshod over Elisa’s refusal to return his love he does seem to genuinely care for her in a way (at the climax of the opera he is unable to carry out his threat to kill her). Guido’s fool Gilberto (a sardonic baritone sung by Christian Oldenburg) provides a good foil to the sulky tyrant with his elegance and comic timing. He interacted wonderfully with the other characters but also shone in his solo aria where he bemoans how much trouble women cause before letting Enrico in to Elisa’s room. Elisa is a demanding soprano role, needing both dramatic projection and agile coloratura, and Rebecca Rasmussen with her creamy voice rose to the challenge magnificently. She threw herself into her character with great expression but also mastered Donizetti’s technical challenges. Her aria where she defies Guido in Act 2 was stunning, with wonderful long arching phrases. Her acting was also very convincing, both in her battles with Guido and when she finally gets to meet Enrico again only to be unfairly accused by him of being unfaithful. There was not a weak link in the cast, with Peter Nyqvist and Christina Nilsson singing their supporting roles finely. 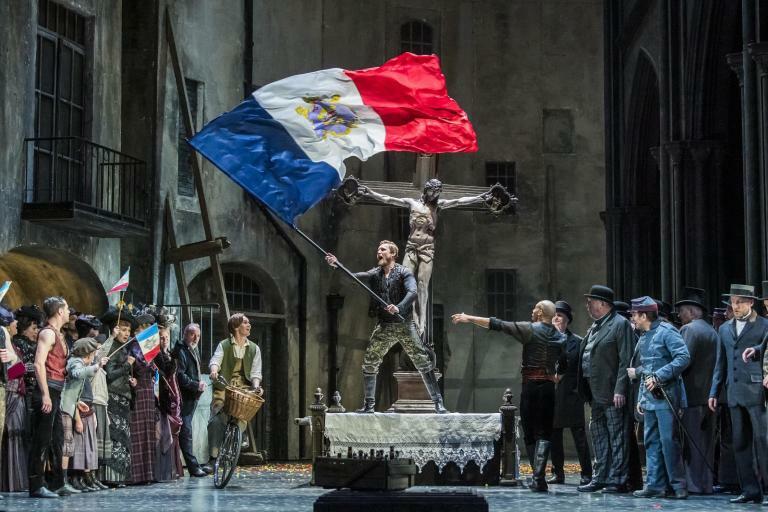 The chorus was well-choreographed and worked well in the opera’s many fine ensemble scenes (though there was one moment when the chorus was a bit ragged). Olof Boman conducted his youthful orchestra with a drive that heightened the drama in the music but also delicacy in the right places. The production had an uncluttered set with some well-chosen animations and went surprisingly well with the sumptuous costumes. The concept was well thought out and went very well with the emotionally engaging music. Now that the Vadstena Academy has rediscovered such a fine opera I hope we will not have to wait another 194 years for its next production! In addition, Enrico di Borgogna thoroughly deserves a recording; and who better to do it than this splendid cast? P.S. This production will be broadcast (pre-recorded) on Swedish radio on 15 September.